It’s my 100th blog post!! That is amazing! I feel incredibly proud, what an achievement. I’ve started a few blogs in the past, but I have only written like 1 or 2 posts on them… but to think I have managed to reach the BIG 100! Fabulous – feeling oh so proud. Also, HAPPY DECEMBER! It is the month of Christmas, and I couldn’t be more excited for the holidays. Anyway, today’s post has been one of my favourites to write, sometimes it is nice to reminisce and have a deep meaningful think about life. Does anyone else find it amazing how diverse our human characteristics are? What makes one person wish to be a policeman, and the other a nurse? A career is one of the biggest aspects of a person’s life. It can build relationships, make you feel a sense of accomplishment, whilst supporting you financially which… can then (if you want to) allow you to start your own little family! I am quite a firm believer in choosing a career path that you seriously ENJOY and are completely passionate about, rather than thinking of the pound signs. Money is obviously an important factor, but it isn’t worth being unhappy, for pretty much every single day of your life, for like 50 years. This is probably why I have gone down the design pathway of life, rather than something like science. I like being creative, and I always have. 1) a Princess – Who didn’t want to be a princess when they were younger? (or still want to be one now… ) Disney is 100% to blame for this, setting us poor kids up for false hope hey?! Oh to live the life of wearing sparkly dresses all day, everyday, whilst being looked after by my handsome Prince, who wouldn’t want this?! As you grow up I guess it kind of becomes apparent that you can’t really ‘become’ a princess. What a sad reality. 2) a Supermarket Till Girl – Oh the fascination I used to have about those poor people sat behind the tills in the supermarket. I was SO jealous of them, I wanted to be behind there with them, scanning away all of the foods. So much so, that I spent most of my childhood years playing (talking to myself, and my pretend customers, who were very real back then) with my ‘supermarket toy scanner till thingy’ – what are they called?! Who’d have thought I would actually become a check out girl when I was 17! Bless me. 3) an Illustrator – Now, this one is still SCARILY TRUE. This was a dream of mine when I was a little bit older than the previous two, but still, a long time ago, yano, when I was around 10 and COMPLETELY addicted to Jacqueline Wilson books. I mean completely, I would buy every single one. I loved Nick Sharratt’s bright and colourful, jolly illustrations on the front covers, and I just wanted to do the same. A few years ago, you could say my childhood dream CAME TRUE, because I have been a very lucky girl, to be in contact with Nick, due to family friends etc, and he really is lovely. Isn’t it weird how life pans out? So, I am actually on the path for one of these careers! Not a princess though, sob sob. Workwear Express recognised that as bloggers, we don’t really have a ‘uniform’ to wear whilst we cosy down and write our blog posts, and all of the other admin sides of blogging. Blogging these days, as a career, is seen to have quite a ‘glamourous’ lifestyle, especially if you are basing your views off of Pinterest and Instagram. But realistically, we love to slum it up in our cosiest scruffs. 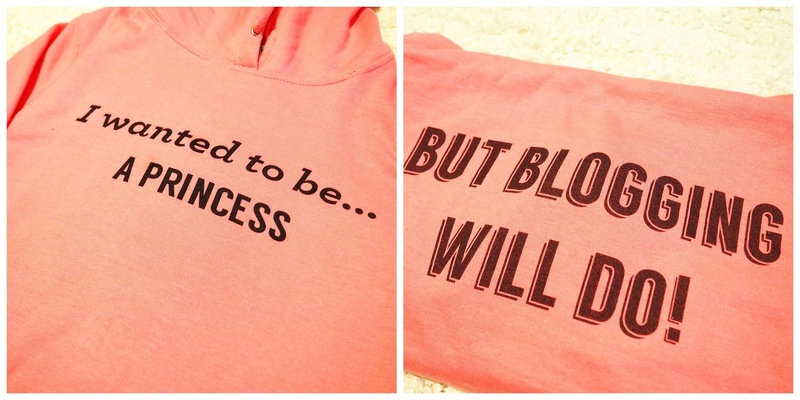 So what would be more perfect than a blogging HOODIE? Workwear Express are a brilliant, AFFORDABLE company, that allow you to personalise ‘workwear’ but in reality you could call it personalised clothing, because they do lots of pieces, such as cardigans, t-shirts, vests, all sorts really. The hoodie is very comfortable, it is quite a thin(ish) one, but that is how I like them, I hate it when a hoodie feels like it is so thick that it is gobbling me up. Plus it is ALL ABOUT THE LAYERS. I do love it, I’ve been wearing it A LOT lately, totally praying that you can’t see toothpaste stains…… (HAHA, see not glamorous at all) My only criticism of the hoodie, would be that I wouldn’t put black text on a pink hoodie, would always opt for white. Another product that has been really hard to photograph, since I don’t have an iron, oh student living, but the WWE website has lots of lovely photos, that are far better than my own, if you fancy a nosey! So I may have wanted to be a princess… but I can tell you now, blogging will MORE than do, I am having an absolute blast! Hope you enjoyed this post lovelies! I think everyone should get themselves a blogging uniform, isn’t it fab? Perfect blogging clothing! What did you want to be when you were younger? How much does it differ to what you are up to now? I love this post! I always wanted to be a singer as a kid, although I changed my mind almost every week – I was very indecisive (and worryingly still kind of am) haha! The jumper is so adorable, I honestly can't remember what I wanted to be but I do think a check out girl was one too! Haha love this post! Totally wanted to be Ariel and wanted to be able to grow really long red hair and be a mermaid. You'd have made a cute princess!! P.s. that jumper is FAB! I love this post Kayleigh. I would love #girlgang hoodies. Imagine everyone wearing one hahaah! Love this post Kayleigh! I love reminiscing back about what I used to want to be. Haha I can totally relate to wanting to be a princess (I think part of me still does). I used to LOVE watching the window cleaner clean the windows with one of those swiping tools that make the soapy window sparkling clean and I really wanted to be one of those. Haha. I also used to want to be a librarian because I thought the idea of stamping books with those date stamps was the COOLEST thing and I was adament that I would always stamp in the lines and in a straight line. Now, i am lovi Woking in marketing and it allows me to be creating but also organised which I like. Congratulations on your 100th post!! Huge huge loves and I can't wait to see you soon! I actually wanted to be a news reader, then an actor, then a news reader, then when I was actually old enough to have a career… I had and still have absolutely no idea.. yay! 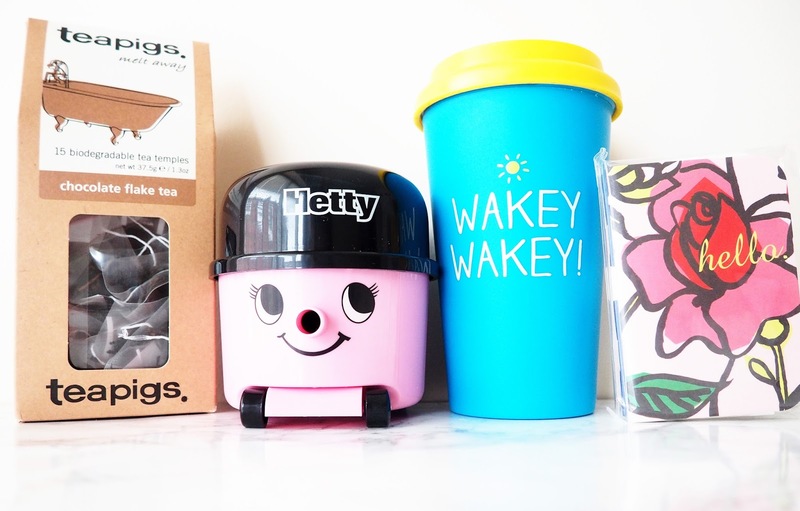 haha What I do now know though is that I want to be that cute lil' HETTY HOOVER. SO CUUUUTE <3 tbf, you are a princess so I hope that's on your cv sweet! Congrats on 100 blog posts! That's amazing! This was such an adorable and nostalgic blog post for me! I've always wanted to be a teacher and now I am one:) Sometimes your little dreams can come true haha:) I love your blog pictures as well!